Property Size 1,728 sq. ft. 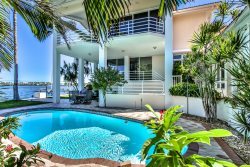 Located directly in the heart of Key Colony Beach with quick access to the Atlantic Ocean, or the Gulf of Mexico through Vaca Cut. This is a single family, water-front home with 3 bedrooms, 3 full baths, and a private, heat optional pool. The upper level offers two master bedrooms with en suite bathrooms, a spacious living, kitchen and dining room. The kitchen is modern and even has a special coffee/tea/wine bar. The entire west side of the living area looks out onto the pool and canal where boat dockage is available. Relax on the balcony overlooking the pool with a chilled beverage and grill your dinner. The ground level offers a full bedroom and bath which has access to the pool and outdoor patio area. (No interior access to upstairs). The patio includes a seating area, grill and bar. All linens provided, beach towels, dishwasher, microwave, central air conditioning, and well equipped kitchen. Dock has fish cleaning table, water, electric, and bait freezer. Internet ready. Pool heat optional. Pet Restrictions: Please ask about pets. Fee is based off breed, size & number.